In our latest Modern Library essay, we delve into Janet Malcolm’s classic on the ethics of journalism at length, pointing to how her pre-Internet examples of opportunistic reporting are even more applicable in social media and citizen journalism. Is journalism a hopelessly flawed medium? Or can empathy and greater transparency salvage its worst instincts? One of the mistakes often made by those who immerse themselves in Janet Malcolm’s The Journalist and the Murderer is believing that MacDonald’s guilt or innocence is what matters most. But Malcolm is really exploring how journalistic opportunity and impetuous judgment can lead any figure to be roundly condemned in the court of public opinion. Malcolm’s book was written before the Internet blew apart much of the edifice separating advertising and editorial with native advertising and sponsored articles, but this ongoing ethical dilemma matters ever more in our age of social media and citizen journalism, especially when Spike Lee impulsively tweets the wrong address of George Zimmerman (and gets sued because of the resultant harassment) and The New York Post publishes a front page cover of two innocent men (also resulting in a lawsuit) because Reddit happened to believe they were responsible for the 2013 Boston Marathon bombing. Mike Wallace (narrating): Even government prosecutors couldn’t come up with a motive or an explanation of how a man like MacDonald could have committed so brutal a crime. But Joe McGinniss thinks he’s found the key. New evidence he discovered after the trial. Evidence he has never discussed with MacDonald. A hitherto unrevealed account by the doctor himself of his activities in the period just before the murders. 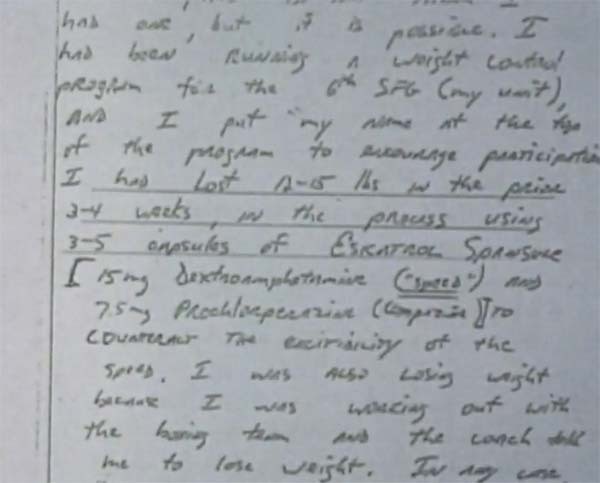 Joe McGinniss: In his own handwriting, in notes prepared for his own attorneys, he goes into great detail about his consumption of a drug called Eskatrol, which is no longer on the market. It was voluntarily withdrawn in 1980 because of dangerous side effects. Among the side effects of this drug are, when taken to excess by susceptible individuals, temporary psychosis, often manifested as a rage reaction. Here we have somebody under enormous pressure and he’s taking enough of this Eskatrol, enough amphetamines, so that by his own account, he’s lost 15 pounds in the three weeks leading up to the murders. Wallace: Now wait. According to the note which I’ve seen, three to five Eskatrol he has taken. We don’t know if he’s taken it over a period of several weeks or if he’s taken three to five Eskatrol a day or a week or a month. McGinniss: We do know that if you take three to five Eskatrol over a month, you’re not going to lose 15 pounds in doing so. Jeffrey MacDonald: I never stated that to anyone and I did not in fact lose fifteen pounds. I also wasn’t taking Eskatrol. MacDonald: Three to five capsules for the three weeks. MacDonald: And that’s a possibility. Wallace: Then why would you put down here that…that there was even a possibility? MacDonald: I don’t think that I did. It is also fact that if Jeffrey MacDonald were taking three to five Eskatrol Spansules daily, he would have been consuming 75 mg. of dextroamphetamine — more than enough to precipitate an amphetamine psychosis. Note the phrasing. 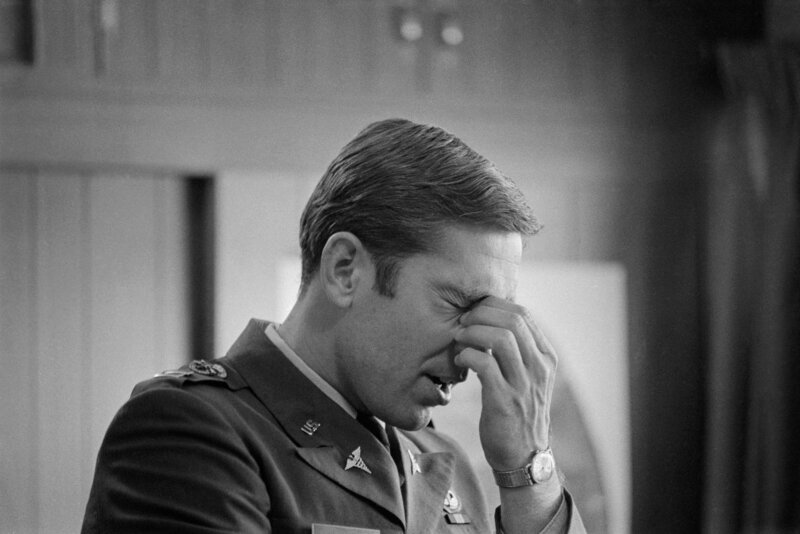 Even though McGinniss does not know for a fact whether or not MacDonald took three to five Eskatrol (and MacDonald himself is also uncertain: both MacDonald and McGinniss prevaricate enough to summon the justifiably hot and bothered mesh of Mike Wallace’s grilling), he establishes the possibility as factual — even though it is pure speculation. The prognostication becomes a varnished truth, one that wishes to prop up McGinniss’s melodramatic thesis. 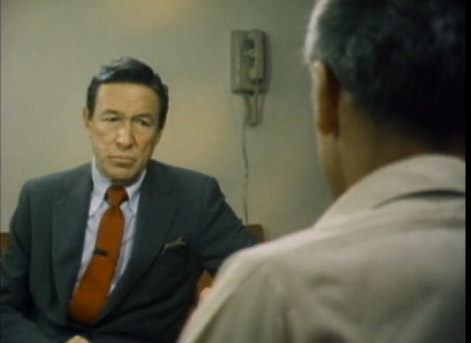 As Mike Wallace — who had received an advance copy of Fatal Vision without difficulty or a lecture — read out loud to MacDonald passages in which he was portrayed as a psychopathic killer, the camera recorded his look of shock and utter discomposure. Wallace was reading MacDonald’s own notes to his attorney back to him, not McGinniss’s book. These were not McGinniss’s passages in which MacDonald was “portrayed as a psychopathic killer,” but passages from MacDonald’s own words that attempted to establish his Eskatrol use. Did Malcolm have a transcript of the 60 Minutes segment now readily available online in 1990? Or is it possible that MacDonald’s notes to his attorney had fused so perfectly with McGinnis’s book that the two became indistinguishable? This raises important questions over whether any journalist can ever get the facts entirely right, no matter how fair-minded the intentions. It is one thing to be the hero of one’s own story, but it is quite another to know that, even if she believes herself to be morally or factually in the clear, the journalist is doomed to twist the truth to serve her purposes. It obviously helps to be transparent about one’s bias. At one point in The Journalist and the Murderer, Malcolm is forthright enough to confess that she is struck by MacDonald’s physical grace as he breaks off pieces of tiny powdered sugar doughnuts. This is the kind of observational detail often inserted in lengthy celebrity profiles to “humanize” a Hollywood actor uttering the same calcified boilerplate rattled off to every roundtable junketeer. But if such a flourish is fluid enough to apply to MacDonald, we are left to wonder how Malcolm’s personal connection interferes with her purported journalistic objectivity. In the same paragraph, Malcolm neatly notes the casual abuse MacDonald received in his mailbox after McGinniss’s book was published — in particular a married couple who read Fatal Vision while on vacation who took the time to write a hateful letter while sunbathing at the Sheraton Waikiki Hotel. This casual cruelty illustrates how the reader can be just as complicit as the opportunistic journo in perpetuating an incomplete or slanted portrait. The important conundrum that Malcolm imparts in her short and magnificently complicated volume is why we bother to read or write journalism at all if we know the game is rigged. The thorny morality can extend to biography (Malcolm’s The Silent Woman is another excellent book which sets forth the inherent and surprisingly cyclical bias in writing about Sylvia Plath). And even when the seasoned journalist is aware of ethical discrepancies, the judgmental pangs will still crop up. In “A Girl of the Zeitgeist” (contained in the marvelous collection, Forty-One False Starts), Malcolm confessed her own disappointment in how Ingrid Sischy failed to live up to her preconceptions as a bold and modern woman. Malcolm’s tendentiousness may very well be as incorrigible as McGinnis’s, but is it more forgivable because she’s open about it? It can be difficult for Janet Malcolm’s most arduous advocates to detect the fine grains of empathy carefully lining the crisp and meticulous forms of her svelte and careful arguments, which are almost always sanded against venal opportunists. Malcolm’s responsive opponents, which have recently included Esquire‘s Tom Junod, Errol Morris, and other middling men who are inexplicably intimidated by women who are smarter, have attempted to paint Malcolm as a hypocrite, an opportunist, and a self-loathing harpy of the first order. Junod wrote that “it’s clear to anyone who reads her work that very few journalists are animated by malice than Janet Malcolm” and described her work as “a self-hater whose work has managed to speak for the self-hatred” of journalism. Yet Junod cannot cite any examples of this self-hate and malice, save for the purported Henry Youngman-like sting of her one liners (Malcolm is not James Wolcott; she is considerably more thoughtful and interesting) and for pointing out, in Iphigenia in Forest Hills, how trials “offer unique opportunities for journalistic heartlessness,” failing to observe how Malcolm pointed out how words or evidence lifted out of context could be used to condemn or besmirch the innocent until proven guilty (and owning up to her own biases and her desire to interfere). Malcolm is not as relentless as her generational peer Renata Adler, but she is just as refreshingly formidable. She is as thorough with her positions and almost as misunderstood. She has made many prominent enemies for her controversial positions — even fighting a ten year trial against Jeffrey Masson over the authenticity of his quotations (dismissed initially by a federal judge in California on the grounds that there was an absence of malice). Adler was ousted from The New Yorker, but Malcolm was not. In the last few years, both have rightfully found renewed attention for their years among a new generation. “Madame Bovary, c’est moi,” Flaubert said of his famous character. The characters of nonfiction, no less than those of fiction, derive from the writer’s most idiosyncratic desires and deepest anxieties; they are what the writer wishes he was and worries that he is. Masson, c’est moi. Othello hoped that in telling “a round unvarnished tale,” he would be able to come clean with Brabantio over why he had eloped with the senator’s daughter Desdemona. He wishes to be straightforward. It’s an extremely honorable and heartfelt gesture that has us very much believing in Othello’s eloquence. Othello was very lucky not to be speaking with a journalist, who surely would have used his words against him. Next Up: Truman Capote’s In Cold Blood!